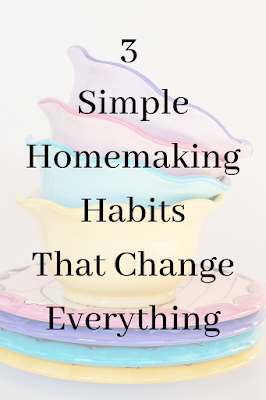 Peaceful Simple Life: 3 Simple Homemaking Habits That Change Everything. 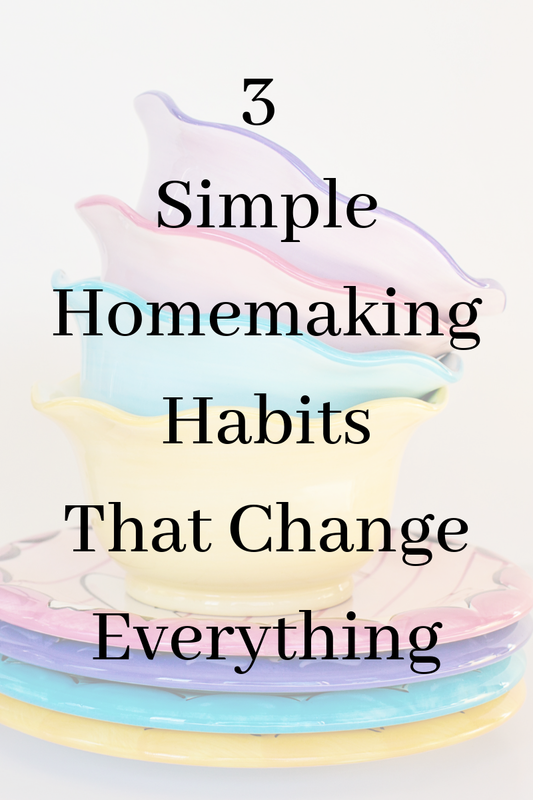 3 Simple Homemaking Habits That Change Everything. I really struggled keeping a routine in Miss. Em's first year of life. She wasn't sleeping through the night routinely, her naps seemed to change every few weeks and I was just doing my best to roll with everything. Miss. Em is now 14 months old and her schedule is much more predictable. I knew it was time to get back into routine. I chose 3 things that don't take much time, but make my life exponentially easier. 1. We make our beds. This seems trivial but it improves the whole look of the bedrooms. It instantly makes the room look neat and organized. You accomplish your first task at the beginning of the day and it motivates you to continue on completing your work. 2. We do dishes after every meal. I used to only do dishes once a day. This meant that I stood in front of the sink for no less than 45 minutes and then had to dry all the dishes. My kids were cranky with me for taking so much time and I felt annoyed that I had to wash dishes for so long. I now do the dishes after every single meal. It takes me no more than 15 minutes to clean everything up. My kids are happy that I am not spending a large chunk of time in the kitchen and it feels quick to me. The other upside is that our kitchen generally looks clean and organized. 3. I do one load of laundry every day. I throw in a load of clothes in the morning, transfer them to the dryer in the afternoon and fold them while I watch a show in the evening. My laundry stays caught up and it feels effortless. If we get sick or are away, we don't have a huge backlog of laundry to return to. If you wanted to choose the item that has the biggest impact, I would say that doing dishes after every single meal is the routine that gives us the biggest payoff. It leads to other benefits, such as ample counter space for meal prep, clean dishes available for meal prep and it contributes to the overall feeling of cleanliness in our home. What routines make your life feel easier? I would love to hear all about them! You are so right about making the bed! I started doing that last year, and it has been a HUGE game-changer for me! It takes like one minute, and my room feels so much neater/more organized! I need to use your dishes suggestion, though, because I absolutely hate doing dishes. It's my least favorite chore by far and I procrastinate with it so much! Yes! It is strange how much of an impact making your bed can have! Dishes really aren't fun, but I do find it easier to do in smaller increments. Good luck!